Hmmm.. Well sounds suspicious from the business standpoint, but from a developer perspective our code is gold !!!! Any ways, this post outlines one of the methods to backup your MSSQL database schema and SQL jobs regularly. This proved valuable to me many times, as MSSQL has slightly loose integration with versioning tools like GIT/SVN/TFS. There are few tools out there in the market to bridge this gap but sadly none are free. With this post content I do not promise to provide any full fledged versioning tool for MSSQL, but a power shell script which to some extent when ran at regular intervals would greatly help you to achieve the necessary backups. 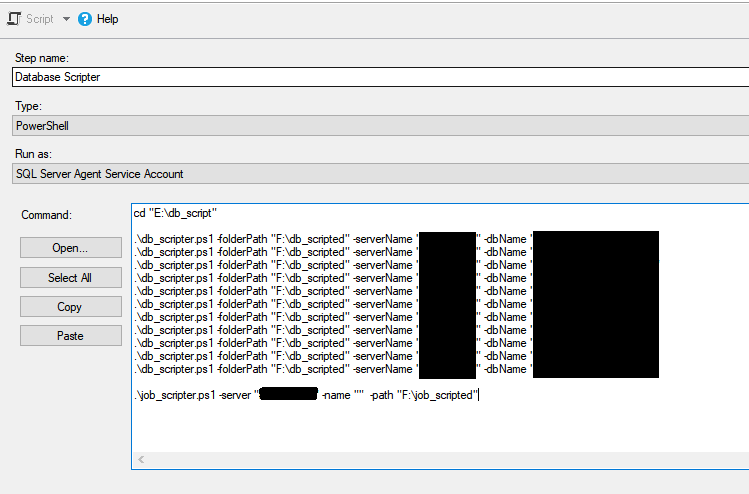 $smolibrary = "C:\Program Files (x86)\Microsoft SQL Server\120\SDK\Assemblies\Microsoft.SqlServer.Smo.dll"
$newfile = $path + "\\$($dateStamp)_" +  $job.Name + ".sql"
Once the above scripts are on the server (Usually the MSSQL Box) you want to take backup you can then just create a job in the MSSQL with the following illustrated step, to regularly call the above scripts with the desired frequency. This would allow to backup only the script/code part of the database, hence when you would like to refer back to an old archive (for your stored procedures, table definitions, views and similar) you are protected by not requiring the whole DB restore to retrieve one code component. And this comes in real handy in case of large databases where restore takes ages. Note: In order for this scripts to work you would need to install the “Shared Management Objects” on the box where this scripts need to execute as they use the “Microsoft.SqlServer.Smo.dll” component.